Come see the details of Mr. Squirrel and his family as they decorate their tree house for the holidays! This is a GREAT Annual Event for families and children! Boy Scout Troop 270 will be there again, helping with the arts and crafts, and the children's games. There is so much to do here, and Starbuck's will be there giving away free coffee and hot chocolate! Come join me in the Gingerbread Contest and let's see what you got! Date: December 12, 2009 9:00 a.m. - 4:00 p.m.
Children may share their holiday wish list with Santa and Mrs. Claus in the Gardens. For a nominal charge, the Friends of Washington Oaks will offer a souvenir photo with the Claus’s. “Santa’s Playground” will include activities for children suc ad hand’s on arts and crafts and game section. Pizza by the slice will also be available for purchase. 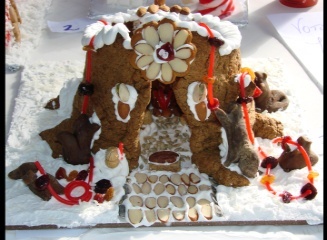 This year we will be having a Gingerbread house contest for all ages! Your Gingerbread house will need to be dropped off at the park between the hours of 8:00am and 9:30am on December the 12th, and remain on display until 4pm. Prizes will be given including a “Mrs. Claus’s Choice” award. To register please call Mark Giblin at 386-446-6783 or mark.giblin@dep.state.fl.us. Other activities include the Friends 2nd Saturday plant sale, food vendors, programs including wreath & ornament making and live entertainment throughout the day. Fees: Fees waived with a donations of toy and non-perishable food items which will be collected at the gate.